Anyone in Portland who buys plums right now is an idiot. Have you even looked at the sidewalk? All that ooshy-gooshy stuff you have walk around or clean off your shoes? Look up! Oh my god, it’s plums. Portland has so many types of plums, and most of them are ripe, almost ripe, or just barely past ripe now. Some of them look like the plums you’ve seen in the grocery store, reddish purple and maybe the size of one and a half golf balls. These are likely Santa Rosa plums. Some are the same size but yellow and just as delicious. Those are Shiro plums. Some are the deepest of purple and oblong-shaped. Those are prunes (off the tree! Not dried! Delicious!). The prunes aren’t quite ready yet, but give them a couple weeks. Many streets of Portland have burgundy-purple trees. The fruit from these trees is cherry-sized and the same color of the leaves (and often hiding under the leaves), so it might be difficult to believe there is fruit up there. These trees are appropriately called purple leaf or cherry plums. I have also seen plum trees with green leaves and cherry-sized fruit that is yellow. I believe those are just simply called yellow cherry plums. I live on a street with a purple leaf plum tree. Its peak season was last week or perhaps the week before. My roommate makes his own wine and goes through several pounds of fruit in each batch, so he is constantly looking for cheap sources of bulk fruit. Right now, there are lots of plums and they are free. We don’t own a ladder, so we drove his bus underneath the purple leaf plum tree. We were so close to the branches we could sit cross-legged on the roof of the bus and pull down handfuls of plums without stretching. The plums were so ripe and juicy they sometimes burst in our hands before we could get them into our buckets. Since they were so small and fragile, my roommate didn’t bother to pit them. He took a potato masher and squished the plums into a tart juice that will become wine, leaving the pits and skins behind. I recommend doing this with any overripe plums. If they’re too soft to eat, squish them up in a bowl and drink it. It’s plum season! Friends don’t let friends buy plums (or plum/prune juice). 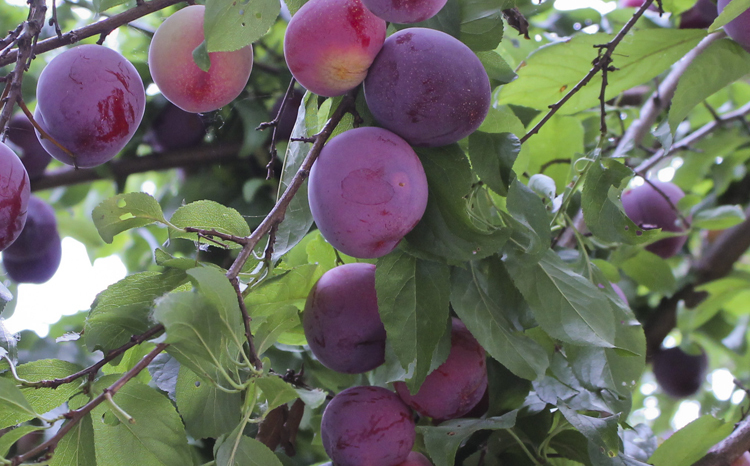 If you have a plum tree, (or other fruit-bearing tree or bush!) PLEASE leave a sign outside inviting neighbors to pick plums, or letting people know what your boundaries are for foragers. It helps to explicitly suggest people bring a stepladder and not shake the branches (this is how we end up with gooey plums underfoot), for example. Foragers: please consider asking permission, even if a tree seems underharvested. If you are too shy to knock on a door, leave a note politely asking, on a fence or next to the sidewalk (not on private property) with a blank space that says “reply here”. Excellent counsel! My boyfriend had a neighbor with an underharvested cherry tree that I was itching to forage, but was too shy to ask and now the cherries are long gone! Lauren, these foraging posts are so fascinating and helpfully detailed. Keep it up! Thanks, Kylie. It’s what I like to do.